No doubt most of you have discovered the 'Vote Windsurfing' page on Facebook where news is being published as it happens together with the views of people like Bruce and Barbara Kendall and Nevin Sayre. For us, this is quick and easy to do as we focus on the main task of talking to the decision makers on the ISAF Council and within National Sailing Authorities round the world. We are working hard in the back ground to build momentum within the general sailing community to redress this decision. Whilst we appreciate that there is a general feeling that kite should be in the Olympic sailing familly, we believe that there is an equally strong belief that windsurfing should be there too. The question on everyone's mind is how we can fulfill both ambitions without impacting the ambitions of the other existing Olympic classes. 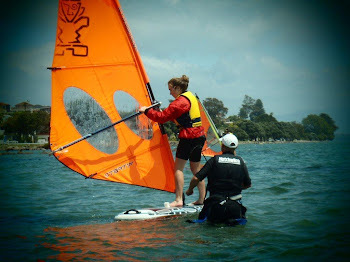 But what can you as a windsurfer do to help? Please change your Facebook profile picture to the one on https://www.facebook.com/votewindsurfing Then every post you make will carry the message. by voting to reopen the discussion in November at the ISAF Conference in Dublin. Olympics. That would make a powerful statement. The key is to keep it positive. Knocking kite is not what we want to do and will be counter productive. There are two RS:X Youth Championships coming up. Young athletes will also have the opportunity to purchase the board after the event at - 30% of the retail price, in that case the rental cost will also be deducted. you register athletes in both the youth men and youth women's fleets. By doing these 5 things, you will send a powerful message. Please keep what you say and what you post in public forums as positive FOR windsurfing as possible.